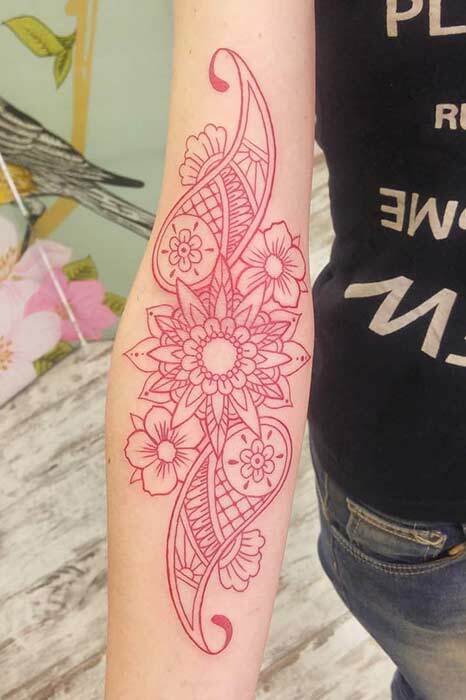 Love unusual tattoos that use cool patterns? Then this idea is for you. Here we have a stunning arm tattoo that features an awesome design. It reminds us of henna tattoo but this one is a permanent one. A tattoo like this is perfect for anyone who likes boho patterns and bright colors. Recreate this or design your own funky pattern. 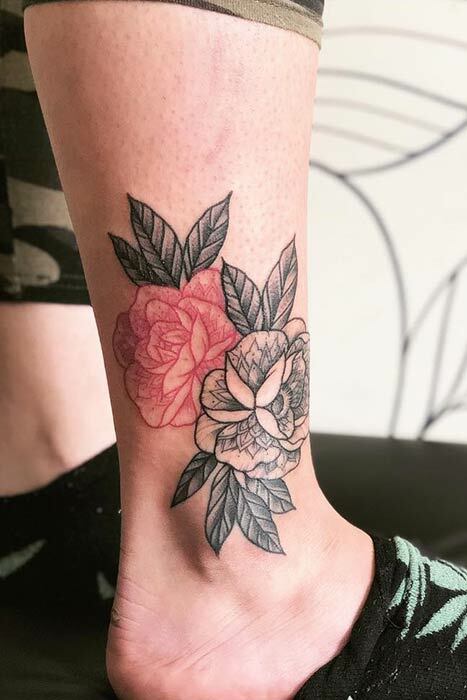 Earlier in the post we featured a red rose flower tattoo. If you loved that one, then you may like this tattoo too. 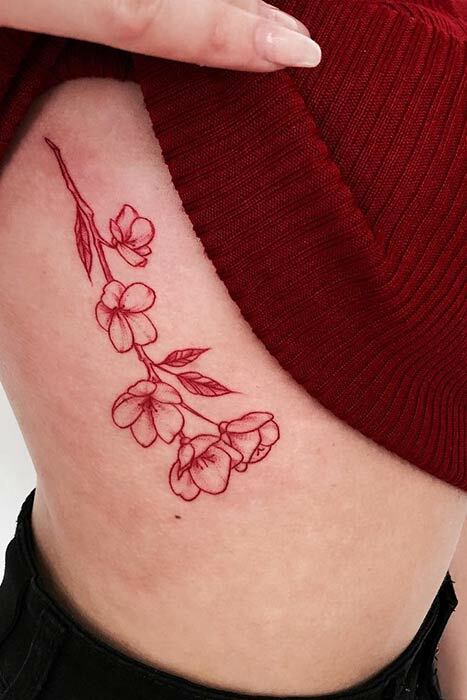 This design features flower branch, tattooed in red ink without any black details. Flowers look stunning and a smaller design like this is great for someone who wants a subtle and pretty tattoo. A tattoo like this can be tattooed anywhere on the body. Next, we have another wrist tattoo. This one has geometric patterns with a mandala design. The tattoo also continues onto the fingers too. It is such a cool and trendy tattoo that will make a statement. 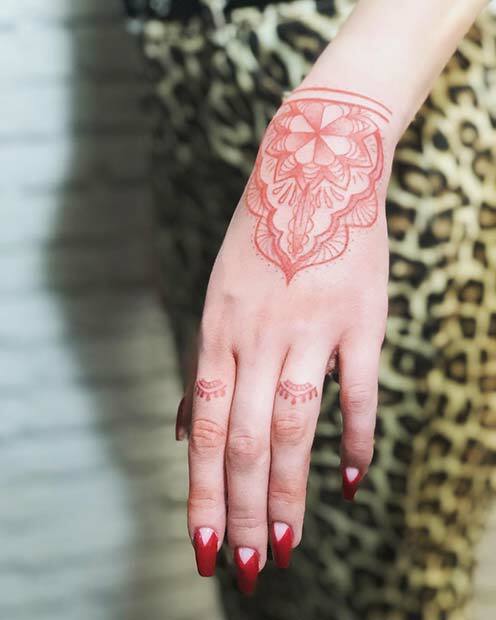 We love this design because it has a henna vibe. Recreate this or you can choose a different wrist design. You can also choose not to have your fingers tattooed and just have the tattoo on the wrist. Our next idea features another unusual and unique design. Here we have an awesome fish tattoo. The fish is so pretty and the red and orange shades used are stunning and they compliment each other perfectly. A fish like this not only looks cool, but can symbolize many things including wealth, wisdom and strength. Collarbone tattoos are believed to be quite painful but the end result is totally worth it! 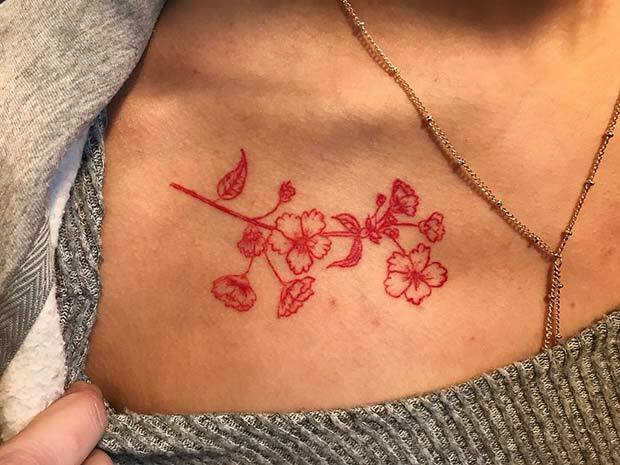 Here we have a beautiful example of a red ink tattoo. This tattoo features stunning flowers that are placed just under the collarbone. It is a bold and gorgeous piece of body art that will suit anyone. Recreate this or try your own floral design. At the beginning of the post we shared a pretty heart tattoo. 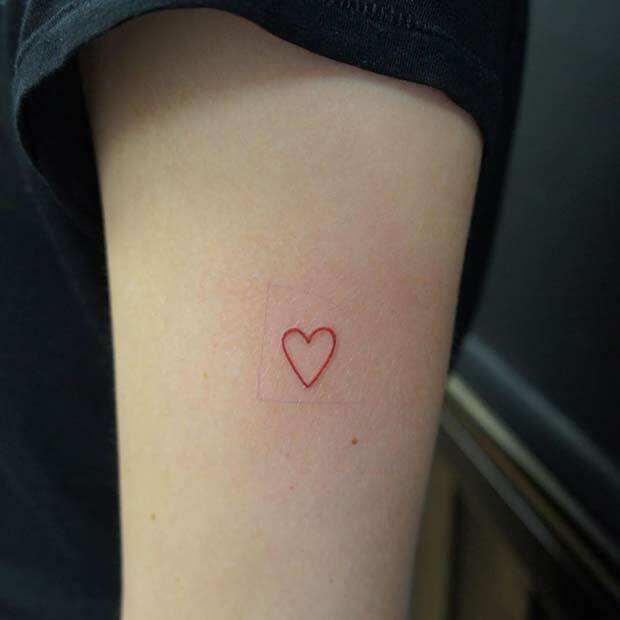 This one is a little similar but instead of a whole heart, this design features just the outline. By just having the outline, the tattoo is subtler but as the ink is red, you still get that cute look. A design like this is a must-have for anyone who wants a simple and stylish tattoo. Want a trendy tattoo that will wow? Then you need to check out this design. 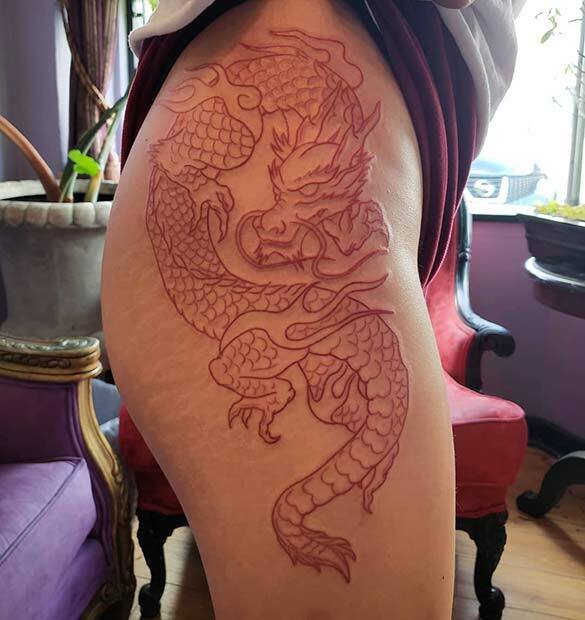 Here we have an amazing dragon tattoo. It has been placed on the thigh and is tattooed in bold red ink. This is just a fabulous and fierce tattoo that will look awesome on everyone. Try just the outline or you can add more red color. Not only does it look cool, but it symbolizes wisdom, strength and more. Poppies are beautiful red flowers so it is no surprise that a poppy tattoo has made it onto this list. 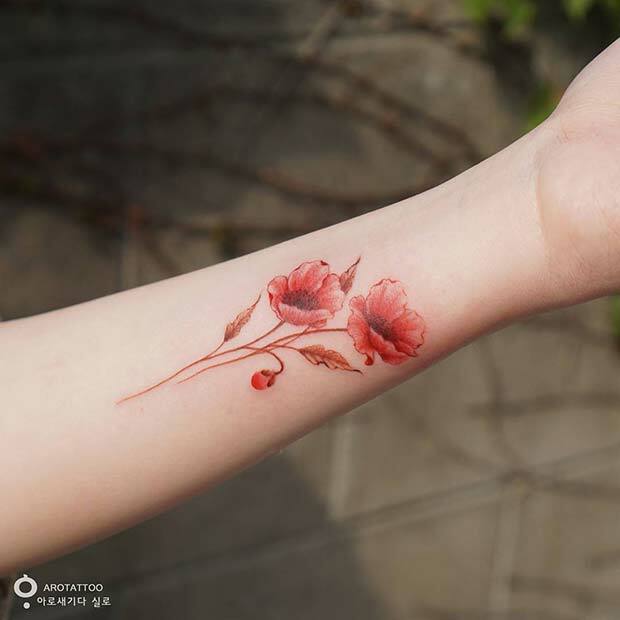 This next tattoo features two stunning poppies with red stems. It is a gorgeous tattoo idea and it will look amazing on anyone. A design like this one can also be used as remembrance tattoo too. Next, we have another cool quote tattoo to share with you. 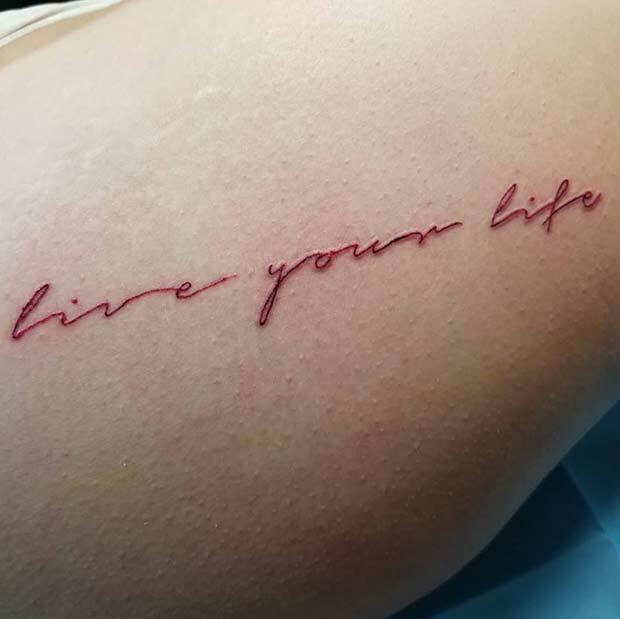 This design features elegant red font that reads “live your life”. A tattoo like this is a reminder to do what makes you happy and to stay motivated. You can recreate this trendy tattoo or choose your own quote. A design like this can be placed anywhere on the body. Our next tattoo idea is elegant, bold and beautiful. The design is tattooed on the back of the leg. It has a stunning pattern that has a botanical, leafy vibe. This is a stylish tattoo and a pattern like this will suit everyone. You can try this design or create your own unique red pattern. 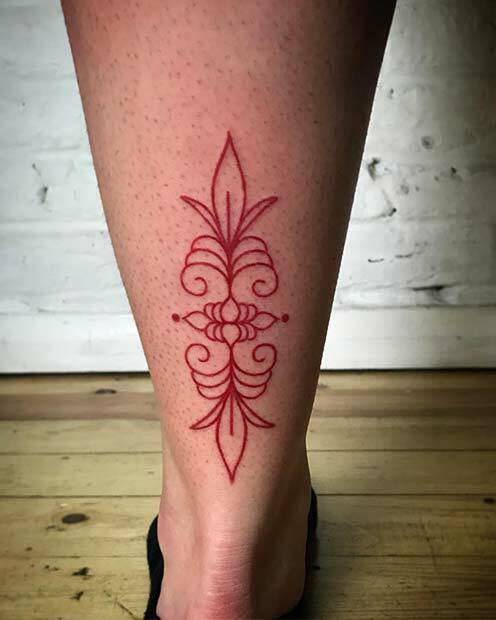 The last red tattoo we have to show you features a gorgeous, floral design. 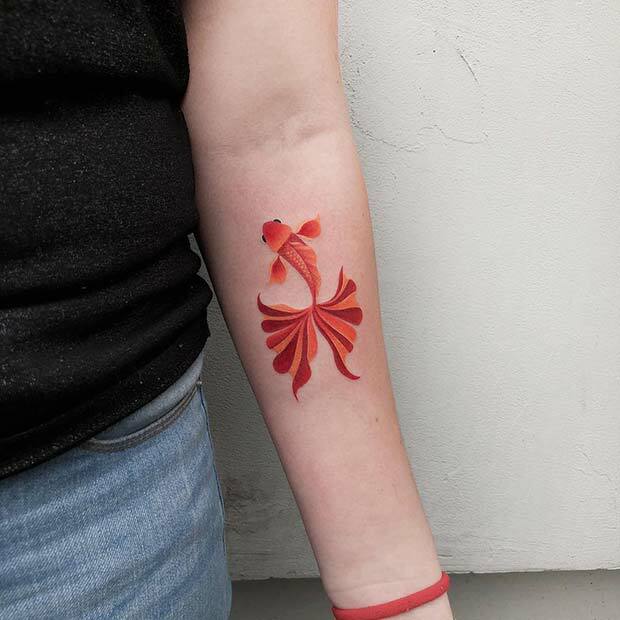 The tattoo features two gorgeous flowers – one i black ink and other in red. This is such a unique tattoo idea with a great placement too. 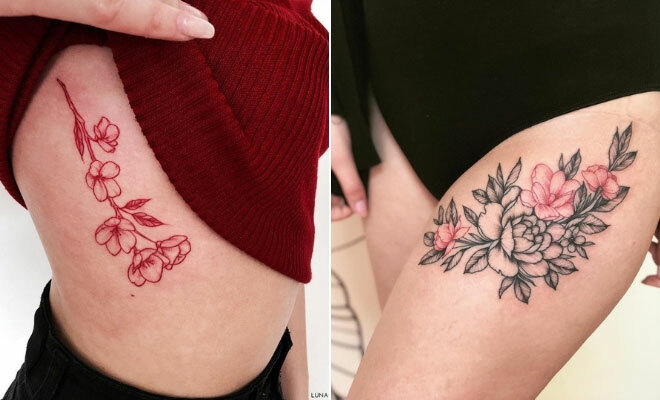 We hope you have been inspired by these red tattoo designs!